As one of the most influential municipalities in the Pacific Northwest, the city of Seattle boasts a unique backdrop of water, mountains and forests, as well as the largest population in the state of Washington. Set against the stunning scenery of Elliott Bay in Puget Sound, the city’s constantly evolving skyline has helped it to forge an identity that capitalises on the connection between natural and urban attractions. The transportation network through Seattle’s eclectic collection of neighbourhoods makes it easy to get to know the city’s unique appeal and convivial atmosphere. Visitors are able to hop on a water taxi in downtown Seattle and take a quick ride to Alki Beach, where they may enjoy stunning views of the surrounding islands and the rustic charm of the region as a whole. In the shadow of the iconic Space Needle building, visitors can revel at the imaginative architecture of Frank Gehry at the Experience Music Project Museum, which showcases rare artefacts from the history of pop music, and the breathtaking glass artwork of Dale Chihuly at Chihuly Garden and Glass. Outside, guests can find the spectacular International Fountain, which captivates audiences day and night with water shows synchronised to music. The Ballard neighbourhood, home to one of the city’s most up-and-coming food scenes, is just 20 minutes from downtown Seattle. With a selection of culinary offerings ranging from bars and eateries to craft breweries and music venues, Ballard guarantees to satisfy any appetite. After a drink with friends or colleagues, visitors can explore the Hiram M Chittenden locks before catching the sunset at Golden Gardens Park. Seattle gives guests the opportunity to appreciate not only the beauty of the Pacific Ocean, but also what lies deep beneath its waves: the Seattle Aquarium, situated on the waterfront in Puget Sound, gives guests a close-up look at the marine life to be found in the bay through its underwater viewing dome. Visitors can witness a variety of sea life, including harbour seals and Pacific spiny lumpsuckers, first hand. 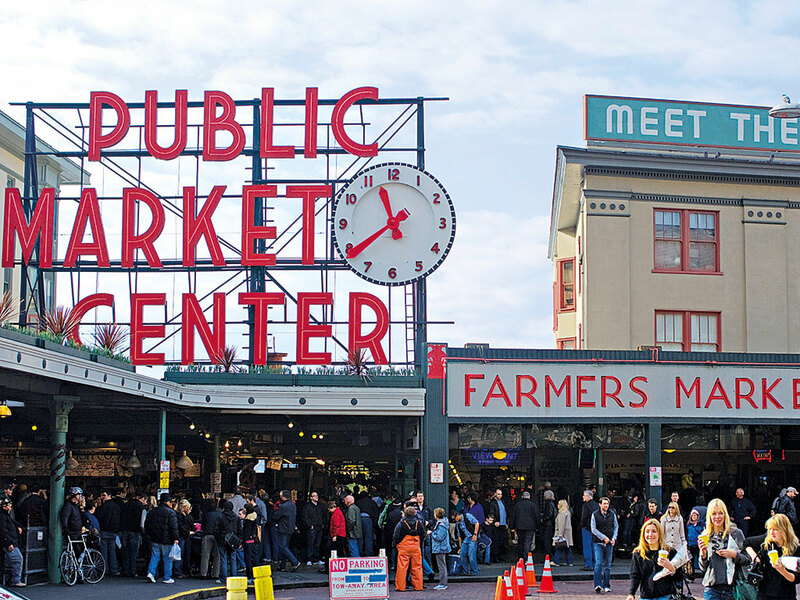 Pike Place Market is one of the city’s must-visit areas, being the oldest farmers market in the US and the site of the very first Starbucks coffee shop. Visitors can tour the market’s historic streets before paying a visit to some of the city’s most exciting museums: the Seattle Art Museum hosts a huge and diverse collection of Native American and modern Pacific Northwest art, incorporating an outdoor sculpture park and a separate museum devoted entirely to Asian art. For spectacular views of the city, tourists shouldn’t head straight for the Space Needle: for a slightly more unusual view, the Sky View Observatory in Pioneer Square – one of the city’s original neighbourhoods – is the highest observation point on the west coast, standing at 902 metres. The 360-degree panoramic view takes in Mount Rainier, Bellevue, the Cascade Mountains, Mount Baker, Elliott Bay and the Olympic Mountains, along with the Space Needle itself and the entirety of Seattle’s stunning skyline. 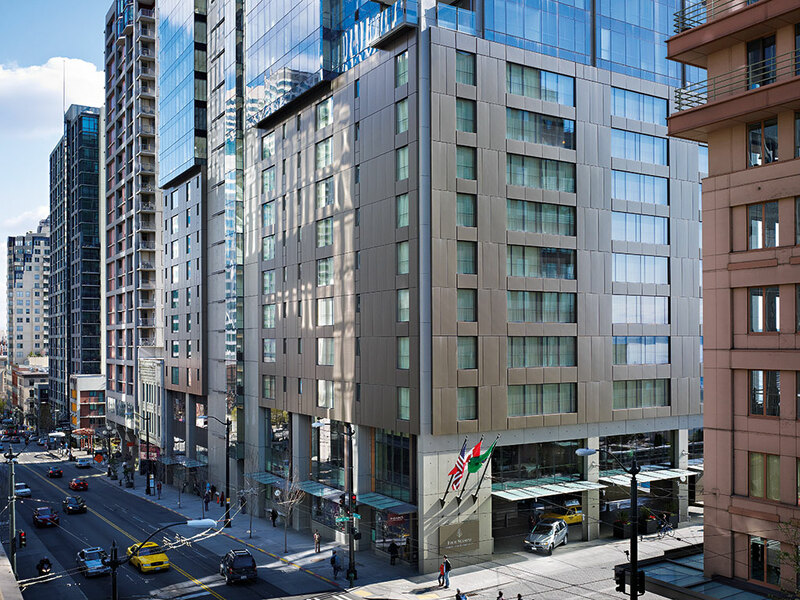 Four Seasons Hotel Seattle offers a ‘resort in the city’ vibe. As the only Forbes Travel Guide five-star hotel in the state, Four Seasons guarantees the finest service paired with spacious accommodation, contemporary décor and exclusive facilities, including an outdoor infinity pool. The hotel’s welcoming Goldfinch Tavern offers Pacific Northwest cuisine, while The Spa provides an array of relaxing treatments. Just steps away from Seattle Art Museum, the Seattle Great Wheel and Pike Place Market – where guests can request exclusive tours from the Four Seasons’ own chefs – the hotel’s central location has earned it a name as one of the city’s top resting points.